This is the first post of the section 'Hardware Basics', in this post we will look at few basic components we use frequently in our projects. 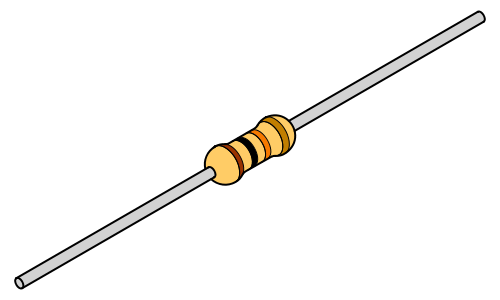 Resistor: Resistor is a two terminal component used almost in all the electronic devices, it resists the flow of current. Depending upon its value they resists(opposes) the flow of current. Analogy: Speed breakers on road which resists the speed of vehicle, in the same way resistors resists the flow of current. To know the value of the resister we should know how to read the colors which is printed on it.We will look how to 'color code' next. Every resistor printed with different color bands and every color have its predefined value, to know the value of the resistor we should know color coding. First color is Brown , next color red, next color black , next color black, next color silver or gold. Get all the information of windows shortcut keys here on this site. And also get the instruction how to use windows shortcut keys. I bought a pair of gucci shoes for my boyfriend at this online store.cheap authentic gucci shoes The quality is very good, the style of sports shoes is very like, it is very worth buying, there are many famous designer brand replica gucci,replica luxury gucci mens sneakers we are sure that it has high quality and appearance.